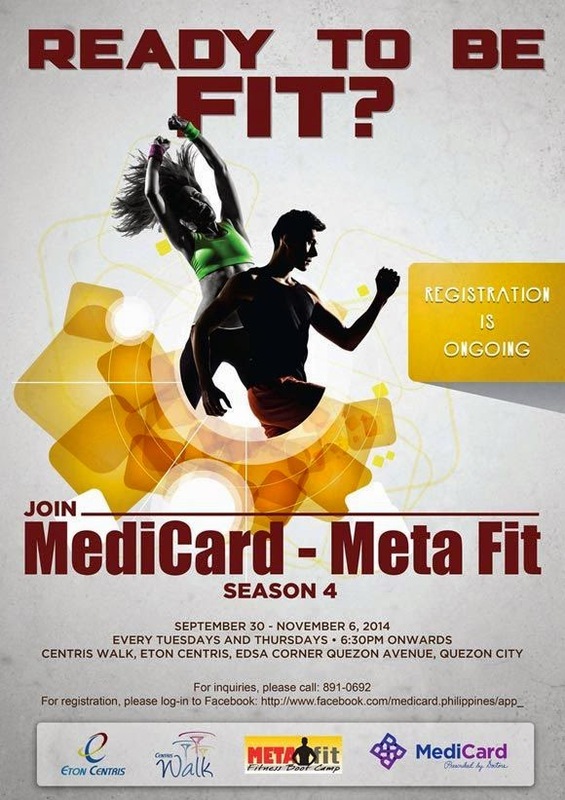 Medicard Philippines, Inc., a leading HMO provider, caps the year with Season 4 of the Medicard-Metafit Fitness Boot Camp at the Centris Walk, Eton Centris in Quezon City, beginning September 30, 2014. This is part of Medicard’s mission of encouraging the public to live healthier lifestyles. Motivational coaches Raffy Tan and Hazel Chua, Kate Joaquin, marketing manager, Medicard Phils. Dr. Nicky Montoya, president, Medicard Phils. Inc., Coach Toni and Coach Jim Saret, Maria Victoria L. Santiago, AVP, Centris Operations, Dra. Jaen Castillo, center head, Medicard Philippines and. Engr. Melencio Silvestre, operations manager, Eton Centris. MediCard-Meta Fit Fitness Boot Camp Season 4’s 12-session program runs on Tuesdays and Thursdays. Online registration for interested participants is open until September 30, 2014 through the official Facebook page at https://www.facebook.com/MEDICard.Philippines.